Vistas deslumbrantes perto do Grand Canyon e muito mais. Pacífica. Proprietário atencioso! Selecionado como a melhor casa de aluguel de férias no estado do Arizona pela revista online BestProducts. Este site de reservas não permitirá um link externo aqui, mas se você abrir a página inicial do BestProducts, pesquise "casa de aluguel de férias" para ver o artigo! O Mountain Star está localizado no coração da Floresta Nacional Coconino, ao longo do corredor panorâmico de San Francisco Peaks, entre a cidade montanhosa de Flagstaff e o Grand Canyon. Esta localização espectacular e conveniente define o Star Mountain além de Williams e outras localidades rurais. Pode ser alugado por apenas 2 dias, mas é ideal para estadias mais longas. O Mountain Star fica a menos de 1 hora de carro da entrada principal do Grand Canyon, e se você não quiser dirigir sozinho, uma van da empresa de turismo local irá buscá-lo diretamente nesta propriedade. Então aproveite o Grand Canyon e, em seguida, deixar o calor e multidões para trás para desfrutar de sua própria refúgio na montanha! A Star Mountain, localizado a uma altitude de 8.000 pés (2.438 metros) em 5 acres bonita e apoiado por terra National Forest, oferece uma beleza de tirar o fôlego naturais, vistas amplas, acesso fácil e directo com a natureza, atividades ao ar livre sem limites (passeios pela natureza e caminhadas, ciclismo, escalada, etc.) e um céu noite espetacular. É um santuário de inspiração, relaxamento, reflexão e rejuvenescimento, bem como sendo perfeitamente situado para diversão ao ar livre e aventura. O espaçoso deck de 2 andares com mesa de piquenique, cadeiras e lareira ao ar livre proporciona uma experiência incomparável do ar e da paisagem montanhosa. A experiência de ver o sol romper o horizonte, todas as manhãs e à noite, lua nasce e lua-conjuntos também. Quando foi a última vez que você deixe uma brisa de montanha, o jogo expansivo de luz e sombra terra, panorama da natureza e os sentidos ricos do momento guiar o seu dia de pensamentos e atividade? A Star Mountain oferece isso para você e seus entes queridos em uma base diária. A Star Mountain é completamente vento e do sol alimentado (com um sistema automático de backup gerador de propano). Durante os meses mais quentes, a casa é 'ar condicionado' com ar refrescante montanha usando as janelas operáveis ​​que estão em todos os cômodos da casa, ventiladores de teto em toda e as persianas operáveis ​​em todo ... e as noites são sempre agradavelmente fresco no mais quente de verão. Um refrigerador evaporativo poderoso e eficaz também é fornecido para as poucas ocasiões em que um pouco de resfriamento adicional é útil! Durante os meses mais frios, a Star Mountain permanece quente com 3 aquecedores radiantes, um gás "lareira" e um muito eficiente, sala pellet fogão. Todas as fotografias ao ar livre neste site foram tiradas diretamente do baralho sala de estar ou de lazer do The Star Mountain. • Espaçoso deck de 2 andares com mesa de piquenique, cadeiras e uma lareira ao ar livre. Corte e divida a madeira fornecida. • Música e exercício loft divertido equipado com uma bateria completa e um violão! Também: um aparelho elíptico e halteres. • Uma biblioteca de livros, incluindo leituras espirituais, de auto-ajuda, de poesia e de inspiração diária, bem como livros de ficção, caminhadas locais e vida selvagem. • Uma lareira de quarto com controle remoto "Mountain Master"
• dias de montanha e noites! Eu vivi na área Flagstaff por mais de 30 anos e conhecer bem a área. Eu calorosamente o convido a experimentar a alegria, conveniência e inspiração do The Mountain Star Resort! Mais de 6 pessoas será considerado em uma base caso a caso e se aceite requer pagamento de taxa extra. What a magnificent home! Seven of us enjoyed every minute from cooking meals to playing games to getting snowed in on NYE! Rob is an incredible host - he provided us with tons of information and helped us customize our trip. The view and sunset are lovely. Thank you, Rob, for providing our family with the perfect place to stay on our AZ vacation! My stay at the Mountain Star was fantastic. The booking process was simple, and the owner was quick and helpful with any questions. The owner met my dog and I at the home, and was a fountain of useful information! From the details about the home to hiking and sight seeing recommendations, it was like having a local guide tell you all the great hidden treasures! The home itself is wonderful. Secluded on 5 acres, close to anything you'd want to do, but isolated enough to provide all the privacy you can ask for. And the views! 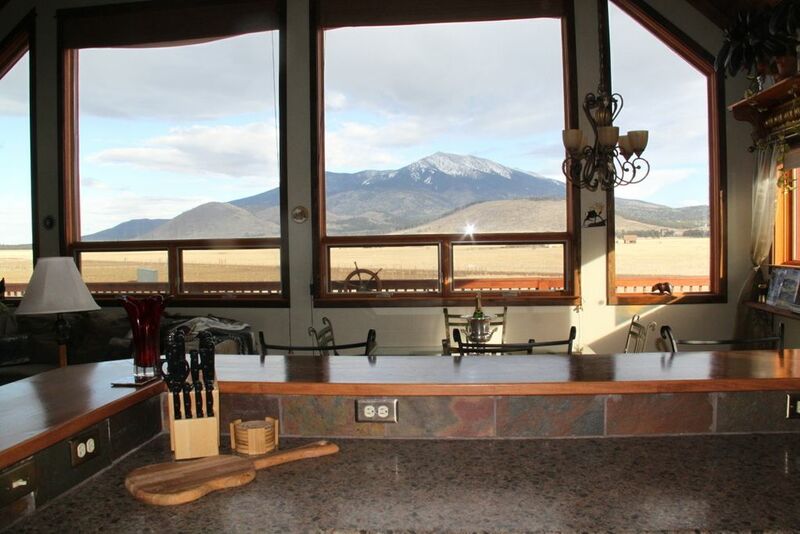 Waking up to Humphrey's Peak is fantastic, and the star gazing at night is phenomenal! The home is also a dog owners dream. My dog went crazy for the 1 acre, completely fenced in lot. Being able to let him run and enjoy himself on a huge lot was a treat for us both. I spend a few fantastic days at the Mountain Star. From fantastic day hikes, to enjoying the fire and reading a book at night. I would enthusiastically recommend the Mountain Star! Amazing views, fantastic guide, and dog paradise! The Mountain Star was a fantastic retreat. Waking up to the views from the property was amazing. The home was very clean, and well taken care of. The owner met us at the home when we arrived, and was a wealth of information about local hikes, scenery and other destinations. Between the recommended hikes (less known places, with fewer tourists), sitting in front of the fire reading, or letting my dog run in the fully fenced 1 acre yard....it was a fantastic experience, and I hope to return! The Mountain Star is absolutely perfect. Beautiful views and very comfy, homey environment. The Mountain Star was perfect for our group of 6 adults. Two had to sleep in the loft each night but they loved it. Rob had everything we needed for our stay plus extras. We would definitely stay here again. The views are spectacular!! We thoroughly enjoyed our 12-day stay at the Mountain Star. The home is very clean, spacious, bright and the location is wonderful. I spent many mornings sitting outside gazing at the mountains, listening to the birds and the wind in the trees. We had everything we needed to make us feel at home. It usually takes me a few days to unwind when I go on vacation, but it only took 24 hours to totally relax in this wonderful home. Rob, the property owner, was very helpful and made us feel welcome. It is very evident that he wants his guests to have a pleasant stay. He provided us with a binder full of activities from which to choose. Lucky for us, we were there long enough to do most of them. I highly recommend the Mountain Star and would definitely stay here in the future. Our host Rob was a great help in providing us with an abundance of information for our Grand Canyon vacation. Most of our outings were recommended by Rob and we really appreciate his thoughtfulness. The house had everything you could need for your vacation and was extremely comfortable and relaxing. It was about an hour from the Grand Canyon and so enjoyable to have so much space around you. The stars at night were amazing. We cooked our meals there after long days out and had a relaxing time talking about what a great day we had. Experiencing the canyon, the lava river cave, a wonderful Grand Canyon Tour and Xtreme Adventure ropes courses for some extra excitement for the kids were wonderful family experiences. Thank you Rob for all your help on our special grandparent, grandkids vacation! Pinho ponderosa bonita e do álamo floresta facilmente acessível (a menos fechado para neve) por bem cuidadas estradas de serviço florestal. Beleza todo! I have a 2-night minimum. My rate drops for 7 or more nights (discounted by 9%). There is a $35 charge per person per day for over 6 guests provided that the larger party size has been approved. There is a $15 charge/day for approved pets(s) (see rental agreement).